I feel like I've been beaten about the legs, back, arms and chest with a bat. It's difficult to walk down stairs, or get up from a chair. All because I spent the weekend ripping out ancient hardwood flooring in my kitchen, and installing the first layer of underlayment. For some background, my house is a 120 year old Victorian, and over the past two-plus years I have been making improvements and renovations. It's slow going because we still have to be able to live in the house day-to-day, and having two small children means no late-night projects. Also, we are budget constrained, and thus I do all the work myself, as well as make creative use of the space we have rather than building major additions and the like. In the spirit of keeping to a budget, I'm making limited updates to our small galley kitchen instead of gutting it and starting from scratch. For instance, instead of adding on, I cut out the wall between the dining room and the kitchen, and will be installing a bar/island which will give us more counter space and storage, and provide additional casual seating. Also, it means leaving the old but still functional cabinets in place. 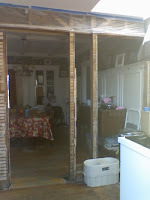 In this photo from 2 months ago (sorry for the poor quality -- it's all I have available right now) you see the first stage of the wall demolition, looking from the dining room to the kitchen. I told you it was a small galley kitchen. In the second shot, you can see from the back door into the dining room. Soon after this, the remaining studs were removed and I put in a header across the span. OK, back to the flooring. T and I decided that I may as well rip out the old bouncy wood floor while the walls are torn up, so I started that job Saturday morning. It's hard to describe how much I hated that floor. It appeared to have been cobbled together with a mix of nice oak and whatever scraps the original builders happened to have lying around at the time. Some boards went side-to-side, some front-to-back, and there were random 1 ft. wide pine boards thrown in. It made me insane. Though I wasn't looking forward to the work, I knew it would be worth it. Remember that I said the kitchen cabinets are staying? This meant that roughly 70% of the boards I ripped up had to be cut flush with the bottom of the cabinets using a reciprocating saw in order to remove them, while leaving the supporting floorboards under the cabinets intact. This is exhausting, back-breaking work. After 5 straight hours of labor, the wood floor was gone, leaving just a single layer of 1" thick sheathing. The sheathing is pretty sturdy -- none of the bouncy squeakiness we were accustomed to -- so it's clear that 120 years of water and foot traffic had just warped the old floorboards. Because the 120 yr old sheathing is bound to be spongy, even though it feels pretty solid, she recommended putting down 1/2" plywood first (not thicker, because I don't want much more than one inch of total height from the sheathing to the top of the tile). Then, a layer of 1/4" HardiBacker. It's a cement board similar to Wonderboard, but easier to work with and thinner. This is glued down to the plywood with thinset, and also screwed into the plywood with special screws. Finally, install the tile (I'm leaning towards slate, which would then have to be sealed). This is more involved and significantly more expensive than I had been planning on, but I think it will be extremely stable and waterproof. I only got as far as laying down the first layer of plywood yesterday, but already I can feel it is more solid, and it will only get better with the HardiBacker on it. In anticipation of installing the tiles sometime in the next few weeks, does anyone out there have any experience with either installing or simply owning a slate-tiled floor? I was told that if I use a really good sealer, it will be maintenance-free for a couple of years, and then will just need to be sealed again periodically. I'd really like to use slate because it will tie in nicely with our bluestone patio. For now, the kitchen is in a state of half-doneness, just like most of the rest of the house. Sigh. Oooh, oooh, can you tell us about what the sealer you'd use is? I have an old (90-year-old) slate patio over our garage, and it leaks like heck into the garage. I'd love to think I could seal it and it might help. Hi Deb. I can't recall the name of the sealant right now, though I'll check when I purchase the tile and get back to you. I'm curious, though, about your situation. You're saying that you have a slate patio installed on a flat roof above your garage? And it leaks? Is the patio installed like one would install an interior floor, with thinset used to adhere the tiles to a subfloor, and grout used to seal the joints? I don't think I've ever seen anything like that, so before I speculate on what might help, let me know if I have understood your situation. Some other things I'd like to know: is the leaking localized, or all over the ceiling of the garage? Is the roof angled slightly to allow runoff to a gutter, or is it perfectly flat? If the tiles do have grout between them, are you sure the grout is still in good shape? And on the off chance I'm completely misunderstanding you, you didn't mean to say that you have a slate roof (overlapping shingles) with a regular wood deck built on top of it, and the water is leaking through the slate roof, did you? Wow, thank you so much for the help. I thought some photos might tell it better, so I posted some on my blog at http://mariposario.blogspot.com/2008/06/ignore-these-photos.html. I don't know what kind of subfloor there is. This is a 1917 stone house with a pretty big attached stone garage. I hope the photos give you a better idea of what I was talking about. Of course, this has, like, NOTHING to do with Objectivism. But I really appreciate the help. it looks like it is kind of concrete up on the ceiling, but there is a regular pattern that looks like wood but doesn't seem to be. Maybe concrete covering some kind of beam? ...I'm guessing that the subfloor under your patio is rebar-enforced concrete spanning those big, rusty metal joists. Maybe it's some sort of modular thing, but conisdering the span between joists, I'm thinking reinforced concrete. By your description of the leaks -- "all over the ceiling of the garage" -- I think you have catastrophic grout failure, and water just goes into the cracks, seeps through, and has found a way to exit into your garage. The freeze/thaw cycle just makes it worse. You know those cracks in the streets? Same thing. The white stuff you see leaching from the concrete in the garage is called efflorescence, and occurs with brick or cement that is chronically exposed to water, or when brick or cement is exposed to both water and other chemicals (like salts). Do you use rock salt on your patio to break up ice? Just curious, but either way, you have efflorescence. After you fix the issue, I'd recommend no more salt, but it's too late for that to help now, until the main problem is addressed. So what to do about it? First, you have to do everything possible to seal your patio, and get water way from it as quickly as possible. 1) You say you have one drain pipe that serves to drain the entire area? It's probably not enough. I'd recommend drilling a number of holes -- 2 to 3 inches in dia. at least -- around the base of the perimeter of that stone wall around the patio (angled down), and install pipes that stick out far enough so that water draining out doesn't hit the walls below. The placement of the pipes will depend on where the water pools in a rain storm. 2) You need to gouge out the old grout, probably with a diamond blade on a circular saw, and re-grout the entire patio. The joints look really wide, so this should be easy. When you regrout, consult with a flooring expert (or the Interwebs) to find out what type of additive you should put into the grout to give it a better seal and more strength. The water-based sealer I talked about in the post (still don't know the brand, but outdoor applications may need different product anyway) can be used to moisten the grout instead of straight water, and it is supposed to result in really solid, waterproof grout. 3) Then, seal the whole patio with the strongest, outdoor-rated sealer you can find. This step takes multiple (3+) coats. And don't skimp on price. If a gallon is $100, so be it. Otherwise it will need to be redone in no time. Hopefully, these steps -- providing adequate drainage, hopefully even in winter, plus strong waterproofing -- will result in your patio not allowing any water through, and instead, it will all flow off the patio into the yard. When you think about it as a science experiment, it gets much eaiser. You have a standing water problem, coupled with a leaky boat problem. Seal the leaks, and find a way to get to water to flow off the surface. That's it. In a related problem, I have found in the past that a good, clean gutter can keep a basement dry. No $15,000 French drains are necessary when you have agood gutter system. (your mileage may vary) Previous owners of my house spent that on a French drain in the basement, and water still got in. I put in a 2 ft. section of gutter, replacing an old wooden gutter that had been roof-shingled over 15 years ago, and totally solved the water problem. It cost me $50. Rule of thumb: keep water away from your structure at all costs, and the roof is the biggest culprit. Oh, and once you have determined that you have stopped the leaks, use a product called Naval Jelly (in any Home Depot paint section) to get rid of the rust on your joists. Then paint them with a some industrial strength paint. Also, you can get rid of the stains on your garage ceiling and walls and paint them with some water-resistant paint. Just don't do that until you're sure you've solved the leaking. That's about as much as I can say without inspecting it myself, but I think this should get you at least 90% there. And none of these things should be hard enough for you to need a contractor. It's just brute force labor and a lot of sweat. Good luck! And feel free to contact me with any questions. ** Note: if your garage is underground, you may have other water issues exacerbating your mold/mildew/moss problem. Namely, you could have water from the soil outside the walls seeping in. If so, make sure any water from the patio or elsewhere is shunted away from the foundation. Then you can bleach/clean/scrub the walls and paint them with some "moist basement"-rated paint. I've never done it, but I know such stuff exists. But I'd suggest solving the roof leaks first. That's the biggest problem by far. It doesn't have anything to do with Objectivism? No, I guess not. But it certainly has everything to do with enjoyment of life on earth, and molding our environment to suit our needs and wants. This is one of the reasons I love working on my house. I bought a nice, perfectly fine house for a reasonable price. But I saw potential, and what I could make of it if I applied myself. It's taking shape, and is already SO much better than it was. And I'm only 2 years into it. With my mind and my hands, I'm "making something from almost nothing". I'm solving problems (and so is my wife -- cutting out the wall between the dining room and the kitchen was her idea, and I was very skeptical of it, but it turned out she was a true visionary) and making my family's life better, and increasing the value of our investment. Howard Roark loved to work in the granite quarries, or on a construction job working with his hands. This is why. It's the meeting of ideas and physical exertion, dedicated toward greater values. I'm exhausted right now -- still! -- but I love it. So this stuff isn't related to the study of Objectivism, but it is the embodiment of the rational life. I know I'm waxing poetic about ripping up floorboards or patching grout, but dammit, there is nothing better than spending a month of weekends doing something like this, and then watching your kids playing on a patio you fixed, and then pulling your perfectly clean car out of your garage. Thank you so much. I can't tell you how helpful this all is. that's how un-handy we are. I'm kind of gung-ho for it now. Will investigate appropriate grout and additives next time I'm at Home Depot. I loved your comments about how this fits into a fulfilled existence, too. Thanks again. I'll keep you posted!